Welcome to the final of my four projects for the Happy Crafters Design Team for December and the first of my projects for 2018. Thanks again to the lovely Ann Melvin of Positively Papercraft for including me in the team. For this one I did something a little different and made a candle using the stamp set Message in a Bottle. 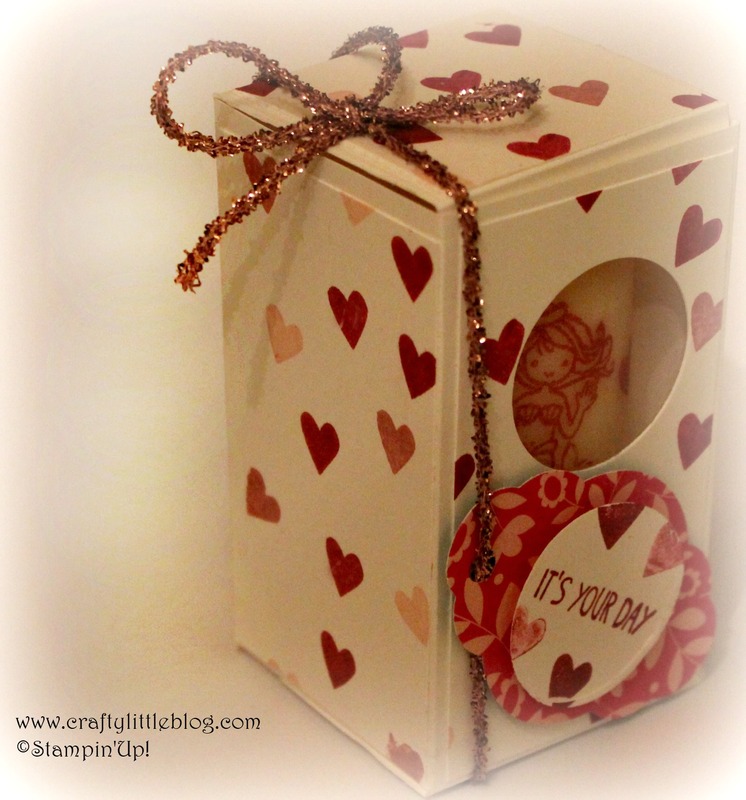 In case you've not seen my previous projects in this little series, the brief was to use this particular stamp set and any other Stampin' Up! products to create something... anything, a card, a box or whatever we chose. 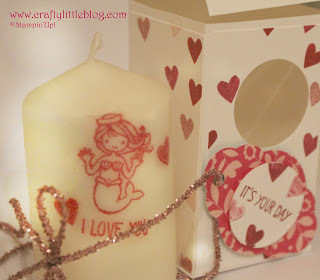 For this I used Berry Burst ink and stamped onto tissue paper (the type that paper napkins are made of) using the mermaid stamp and the heart stamp as well as the I Love You stamp all from the same set. I stamped direct and used the stamping off technique for the hearts. I then used the greaseproof paper technique with a heat tool and melted my design into my candle. I make my own greaseproof paper which allows me to fragrance it and transfer that fragrance onto a pre-made unscented candle, I'll make a video showing how I do it for my You Tube channel this week. 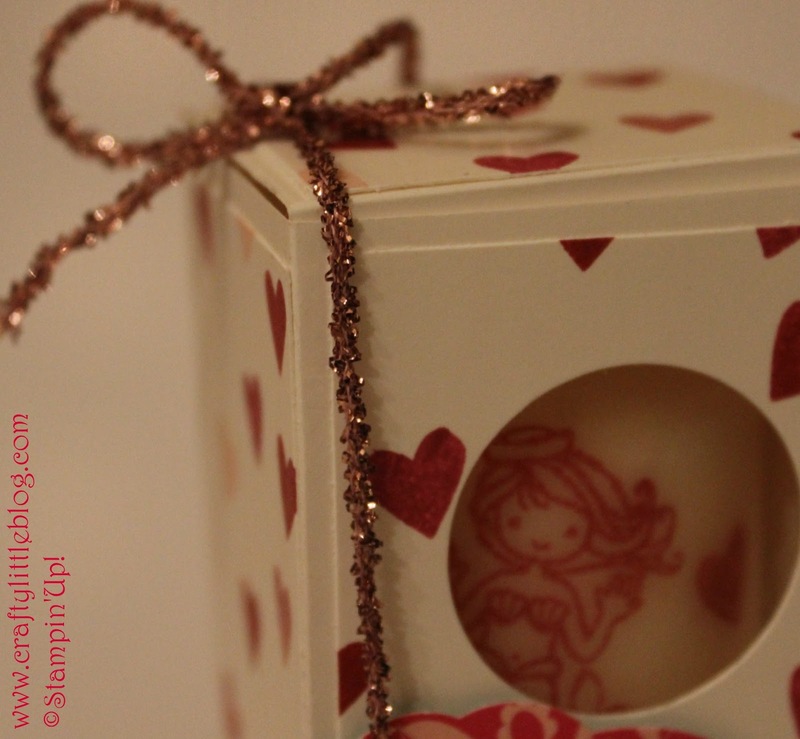 I decided to make a box for my candle and wanted it to also use the same stamp set to carry on the theme. I took some whisper white card stock and created some heart DSP first of all. 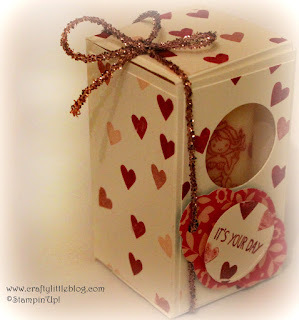 I used the little heart stamp from the Message in a Bottle set and randomly stamped it using Berry Burst, Cherry Cobbler, Powder Pink and Sweet Sugarplum inks. I then cut this into 4 strips which measured three and three eights of an inch by one and seven eights of an inch which were for the sides of my box and another measuring one and seven eights square for the top. I took a piece of Whisper White card stock measuring 8.5 x 7.5 inches to make my box. My candle measured just under 2 inches in diameter by just under 3.5 inches in height to the top of the wick. I scored my card at 2, 4, 6 and 8 inches on the long side and at 2 and 5.5 inches on the shorter side. I burnished the score lines and then cut away the pieces I didn't need to make the box and then attached the DSP panels I'd made before taking a 1.25 inch circle punch and making a hole in the front section of the box. I added a 1.5 inch square window sheet piece to the back of this to enable viewing of the contents whilst protecting the candle and not losing any of the box's structural integrity. I used Tombow liquid adhesive throughout to make the box and add the DSP panels and window sheet. I took the pretty labels punch and punched out a label from the Myths and Magic DSP in the new Spring Summer catalogue which you can buy from tomorrow! To this I attached the disc I'd cut out with the hole punch with dimensionals having stamped it with Berry Burst using the It's Your Day stamp from the Message in a Bottle stamp set. I made a hole in one end of the label and fed through some of this gorgeous Powder Pink mini tinsel trim also from the new Spring Summer catalogue. I tied this in a bow and using some dimensionals I kept the tag in place on the front of the box. I think this would make a gorgeous cute little Valentine's gift for someone especially if they love mermaids or just as a gift for a birthday or any occasion really. It's just so cute and easy to make and can be adapted to suit whatever occasion you wish to use it for. Thank you for dropping in and I hope you've enjoyed this little series. The stamp set is available in the main 2017/18 catalogue from Stampin' Up! and is so cute and versatile. Next week I'll be blogging about the projects which didn't make it as one of my top 4 so why not check those out.